The red-brick exuberance of Cluss's Washington is a memory now. Only a few of the signature buildings of the period remain. Cluss designed and built Washington's only remaining market house (Eastern Market), once a symbol of urban progress. His earliest known building, the fire-house built for the Metropolitan Hook & Ladder Company, is still standing, amazingly enough, squeezed between two huge new condominium apartment buildings. 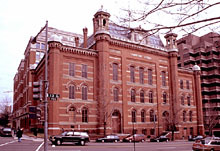 His National Museum remains, although currently mothballed and with an uncertain future, on the National Mall as the Smithsonian Arts & Industries Building. The renovations done by Cluss to the Smithsonian Castle are still intact. Additionally, the re-working of the upper floors of the Patent Office Building (now the Smithsonian American Art Museum and National Portrait Gallery), has been elegantly restored and re-opened to the public. Two of his schools, Sumner and Franklin, still stand, both showpieces in their time. His Calvary Baptist Church, still noted for its community outreach, has had its missing spire restored (2005). His multi-functional buildings for a Masonic Temple and entertainment hall in Washington and the City Hall combined with Masonic Hall in Alexandria, Virginia remain. Only one of his residential houses is left (H.H. Wells Residence), but their influence on townhouse dwellings in Washington remains. At Fort Lesley J. McNair, the building Cluss re-designed as Officers' Quarters is still in use and contains some original woodwork and furnishings, but it is a task of the imagination to think of the building as Cluss originally planned it. These remnants of their age are so alien in style that they need to be reinterpreted to the modern eye. When fully understood, they become time-capsules to open up the history of a Washington that was of its time and place. They are all buildings serving their function in updated ways; Cluss reinvented the forms of the school, the museum, the church, the market, and the urban services for his adopted city. He brought order to the streets and sewers. Cluss was a protagonist of a modern Washington with practical solutions and colorful buildings.